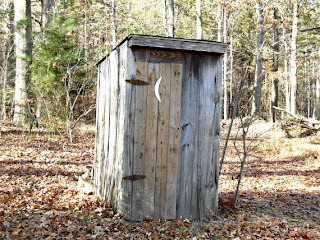 I've been living in a drafty, old farmhouse in the rolling countryside of Northern North Carolina for almost six years. I absolutely love living here. It's beautiful. It's peaceful. 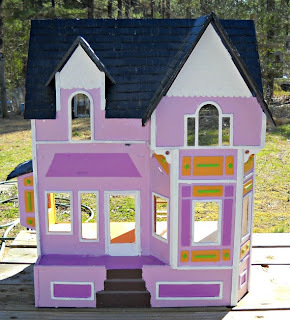 We have great weather and lots of room both inside and outside for the kids to play. But we decided to keep the old, wavy glass windows our home was originally built with. So, I've been making quilted curtains for them to help with the drafts. Here's how I do it. 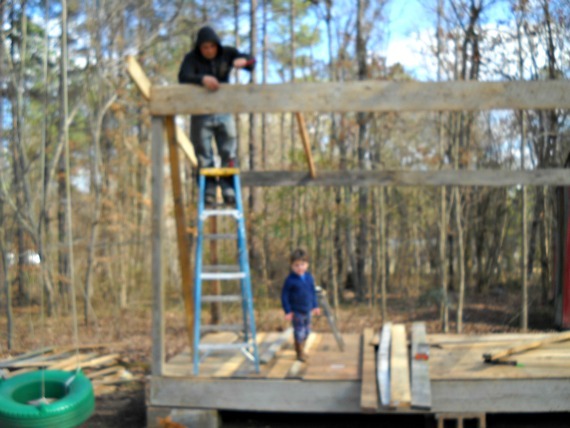 First, measure the window. Do you want the curtain to cover just the window itself? Or the frame, too? Take accurate measurements of the area you want the curtain to cover. Then I do a little math. I determine what block pattern I am going to use for the curtain. Something simple is best for these. Above, I used a 4" snowball. I simply divided the horizontal measurement of my window by 4" to determine how many snowballs I needed to sew for each row. I divided the vertical measurement of my window by 4" to determine how many rows of snowballs I needed to sew. 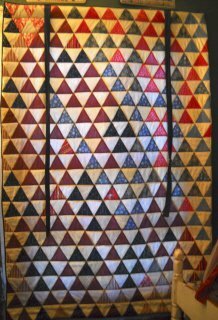 When my measurement does not divide evenly by the number of blocks, I usually add border strips to my curtain to lengthen or widen it, as above. This is my bathroom window curtain. 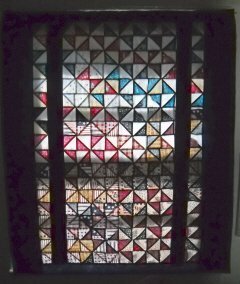 I love the way it looks when the sun shines through, a little bit like stained glass. 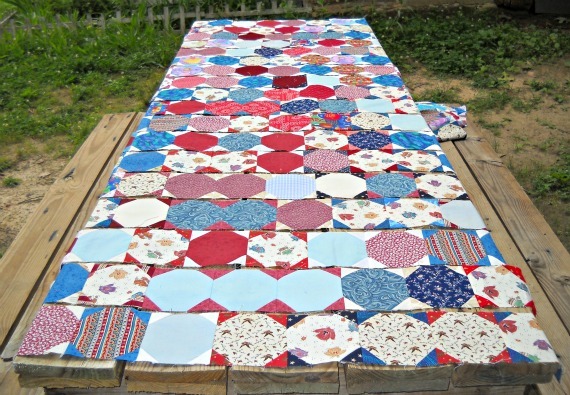 After the top is all sewn together, I make a quilt sandwich like you would with any other quilt: backing, batting, quilt top and do some simple quilting. 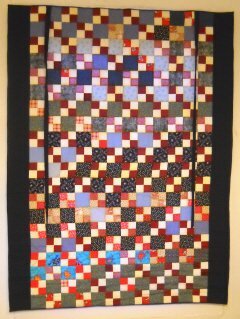 Horizontal lines across the quilt works well for these simple roll-up shades. 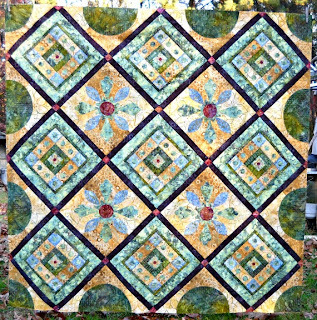 For this most recent shade I quilted a simple loopy design across each row of snowballs. 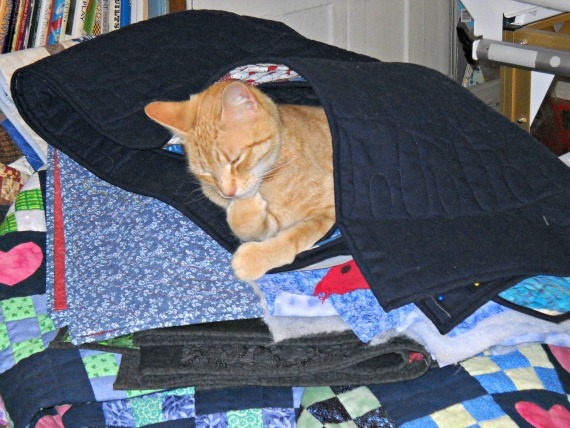 Bind the quilt, as you would any other quilt. 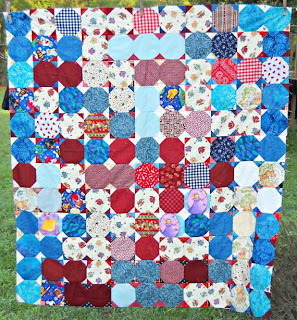 Add a hanging sleeve to the top, backside of the quilt, as you would any other quilt. 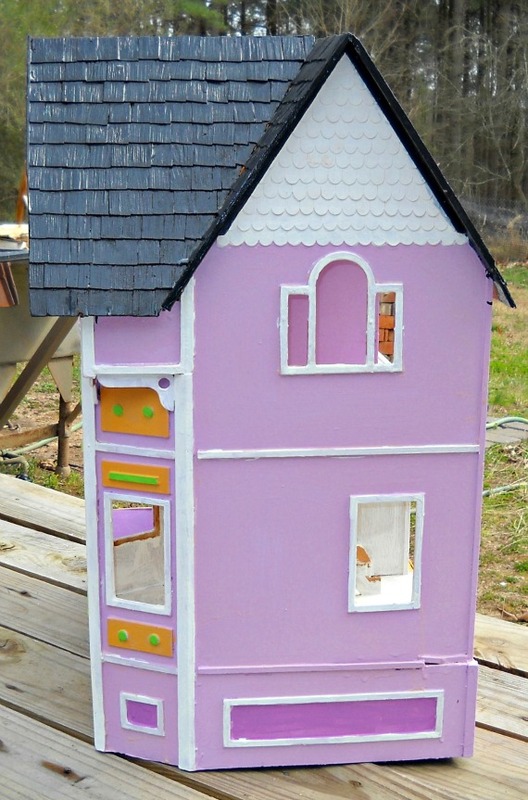 It only needs to be wide enough to easily accommodate the curtain rod you will be using. 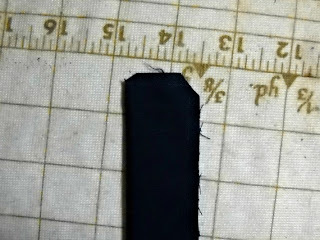 I cut mine from a 6" wide length of fabric. This usually works well for me. My kitty, William, testing out the quilty warmth of the curtain. It passed inspection. I make 4 ties for each curtain. To do this, I cut 4 pieces 2-1/2" wide by the width of the fabric. 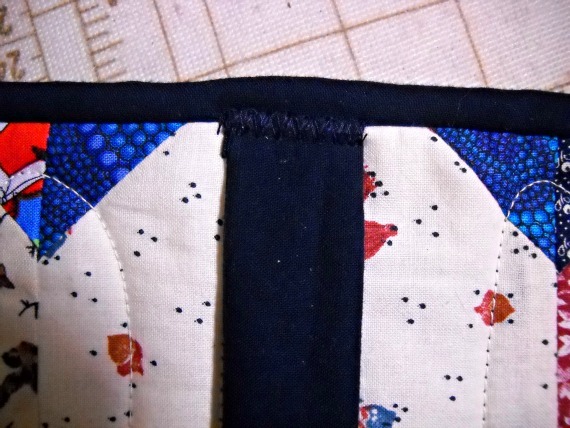 Fold each tie in half lengthwise, pin, and stitch closed using a scant 1/4 seam. 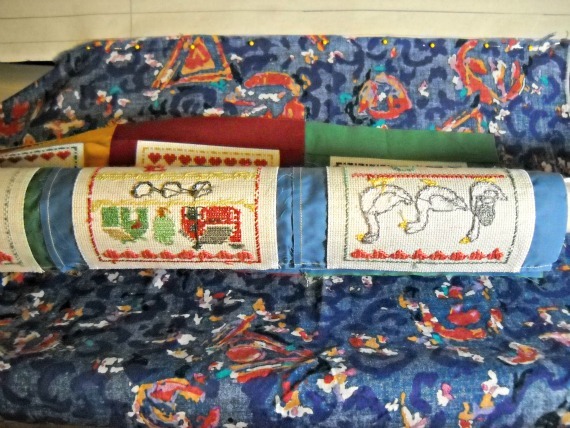 Stitch all the way down the long side and across one of the short ends. Clip the corners, to make turning easier. Then, turn each tie right side out. 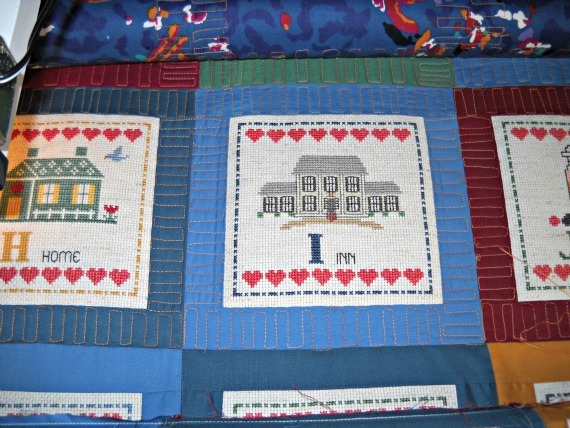 I use a knitting needle to ease the turning and poke out the corners. Press each tie flat. Turning under the raw edge 1/4", baste the ties to the top of the curtain, two on the front, and two on the back. The front and back ties should each be about 6" in from the edge of the curtain and lie opposite each other. Sew across the top of the ties using a zig-zag stitch. I sew back and forth across each tie 2 times for security. Hang the curtain and enjoy! To open and let a little sunshine in, I roll the curtain up from the bottom and use the ties to secure it at whatever height I desire. 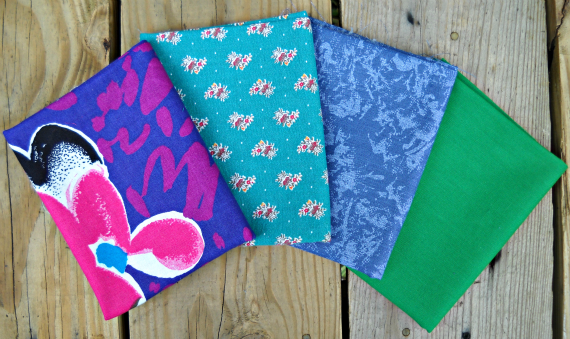 Here's a couple of other curtains I've sewn so far. 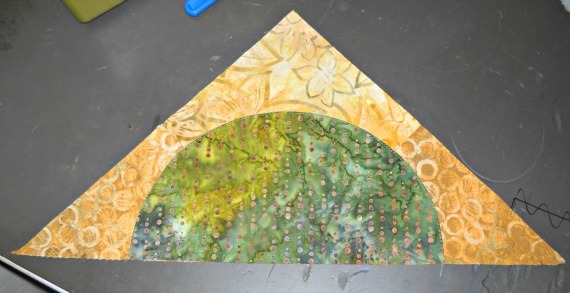 This was fun, all triangles. It's the first one I made. I have a pair of these hanging in my upper stairwell. I'll admit it. 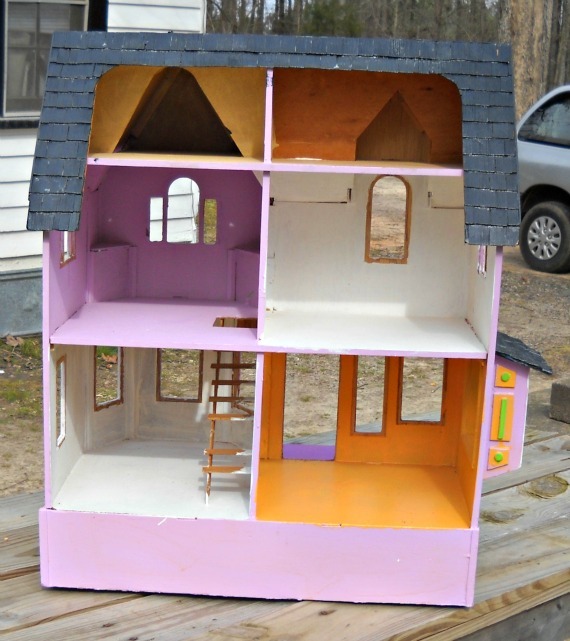 I've always had a terrible weakness for dollhouses. I'm a Mom of 3 boys (think trucks, trumpets, and terrible messes), and still I just couldn't resist this dollhouse. It was only $6.00 at the Goodwill. It needed some love. It needed me, really. 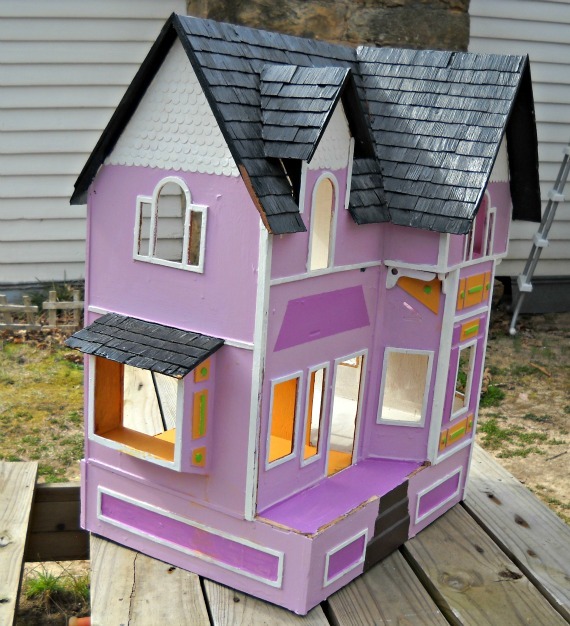 It needs a paint job, too! 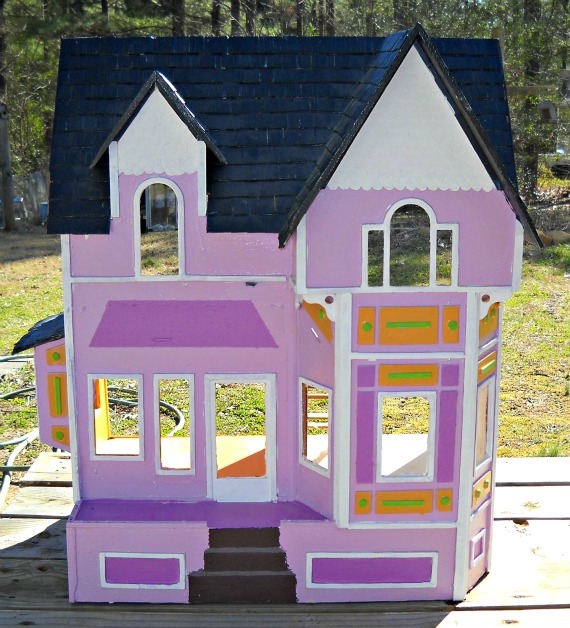 I didn't feel too bad about my purchase, since my husband has been building me a storage building behind our house to keep all my extra stuff in. I have a place to put it. William the cat gave it his stamp of approval. 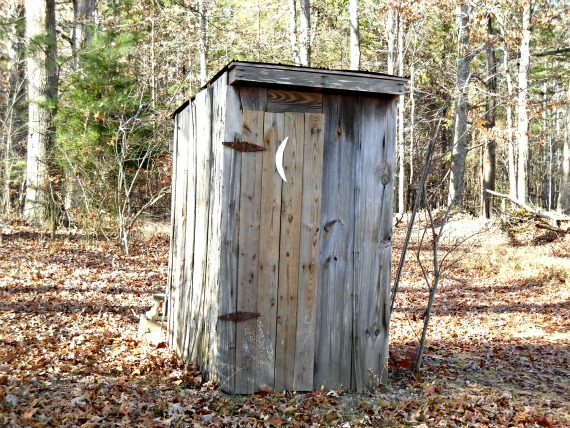 I think he spent the night in there a few times this week. 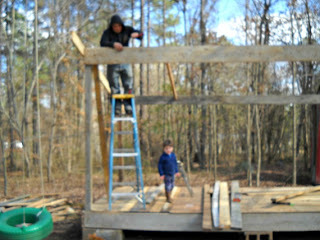 Trent and I worked on it all day yesterday. 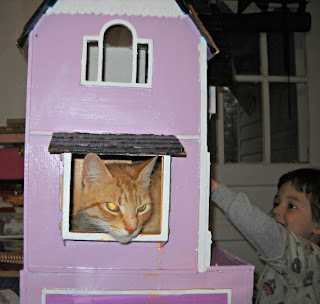 He's enjoying the renovating aspect. First we cleaned it inside and out. 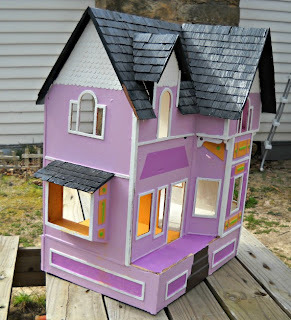 Next, I pried off all the inside window frames and removed the broken bits of plastic from all the windows. The door was really tough to get out. It had been both glued and painted in place. 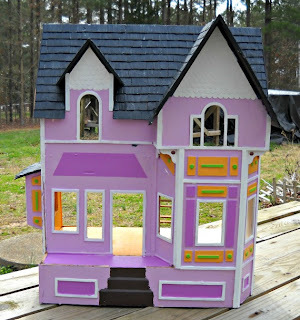 Who glues a dollhouse door? What fun is that? Here's an inside view. I have another set of stairs, but they are a bit too wide. I'm not sure if I'm going to use them or not. After removing all the bits of plastic, I sanded everything and cleaned the inside once again. 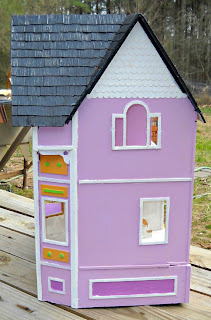 The next thing to do is either build a porch roof to go over the door (see the painted on dark purple section), or cut out the upstairs window to make it into a door and add a balcony over the front porch. I'm still undecided about this. Any thoughts, ideas, or opinions are welcome! 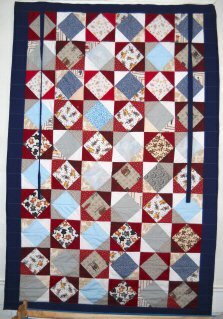 This week, in the United States we are celebrating National Quilting Week, culminating in National Quilting Day on Saturday, March 16th. To celebrate, I'm having a sale in my shop. 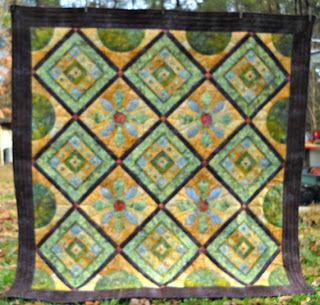 Just use coupon code NQUILTDAY when you check out for 10 percent off any purchase over $10.00. This special is good now through Sunday. Have you visited the Curlicue Creations Shop recently? I've been adding a lot of new goodies! 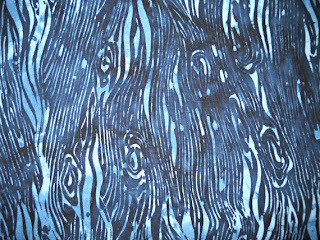 We have a new shop section, for Batik Fabrics. 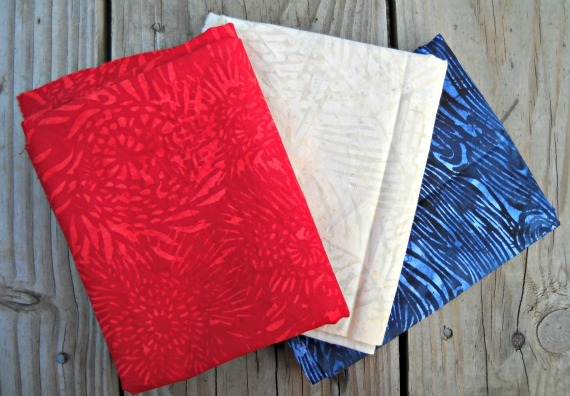 These are all 100 percent gorgeous, 100 percent cotton, and 100 percent made in Bali, by hand. 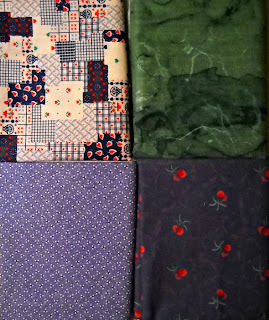 There are also a nice variety of fat quarter bundles waiting to be claimed in the Vintage Fabric section of the shop. Do you have the blues? Vintage Fabric Fat Quarter Sampler "Dalit" is for you! 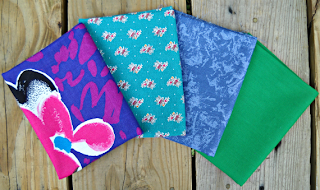 A few of the fabrics that are included in the Vintage Fabric Fat Quarter Sampler "Edna". 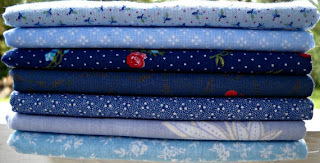 The blues from Vintage Fabric Fat Quarter Sampler "Elisabeta". This a large bundle with all coordinating pinks, whites, and blues. These would make a very pretty vintage or shabby chic style quilt. 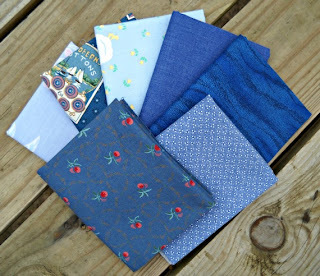 Ah, the Blue Batik Fabric! I think this is my new favorite, though they're all so gorgeous! You can purchase this by the yard. Think quilts, handbags, dresses, home decor! 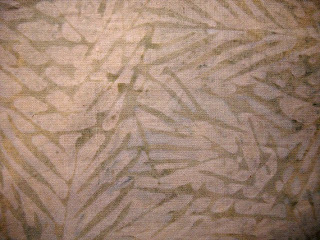 The Cream Batik Fabric is there when you need a calming neutral, or a special background for applique. The Florida Green Batik Fabric is lush, leafy, and saturated with glowing shades of green. Oh yes! Gotta have some of this. Above, is the latest machine I've added to my collection, sewing my WISP. It's a Singer Spartan. 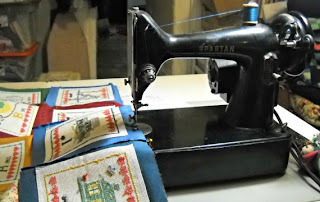 These were make in the United Kingdom, and are very small, like a Featherweight, but with a drop-in bobbin. After a little work, some elbow grease, and a quick on-line printout of the manual, it was up and running. 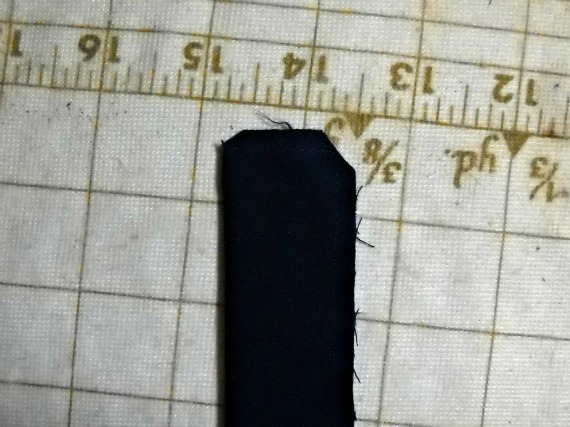 It sews a really nice seam, too. 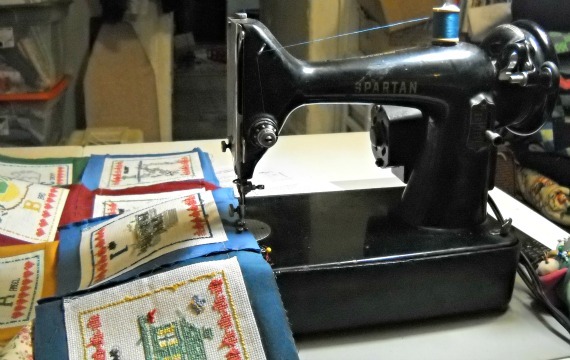 It's a fun machine to sew with. 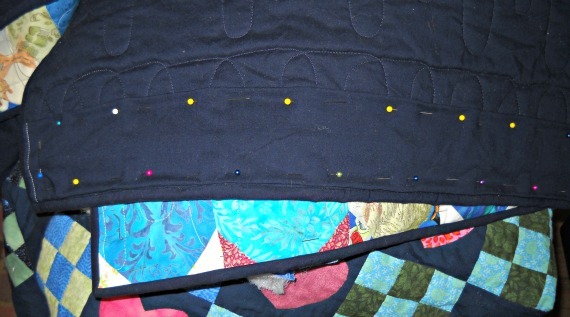 Here's my WISP, as I was sewing the rows together, and hanging on my quilting frame. Yes, it's sideways, but you can see some of the blocks up close and personal. 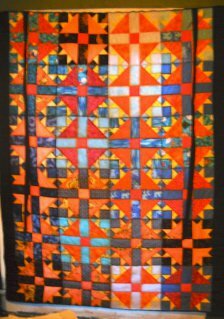 Here's the whole quilt top, sewn together. 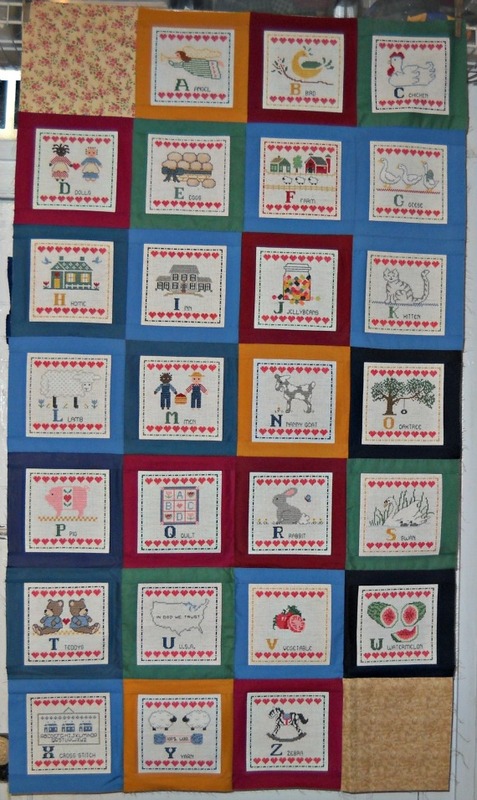 It's an alphabet quilt, made up of cross stitched blocks. 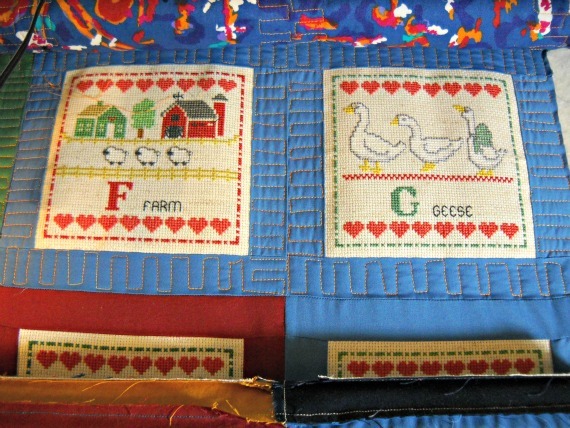 The cross stitch patterns are by Gloria and Pat. I don't remember the name of the leaflet. Here it is, being loaded onto the quilting frame. 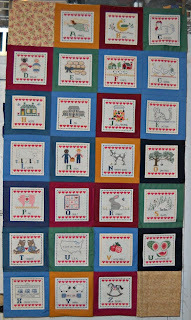 And in these photos, you can see some of the blocks close-up, plus the simple quilting I am doing around each block. I just love the "F is for Farm" block. Look at the cute little sheep! 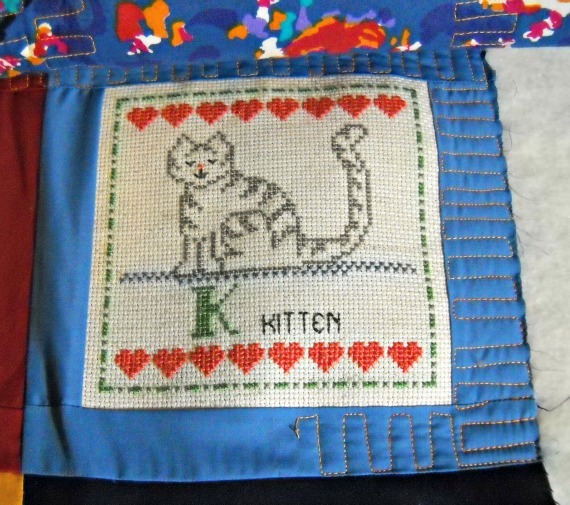 And of course, "K is for Kitten". What else would K be for? 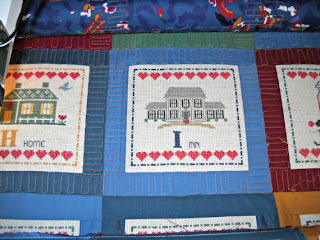 Here are "H is for Home" and "I is for Inn". 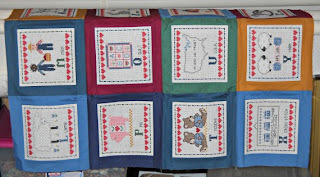 And the story behind this quilt? Why does it qualify for WISP status? 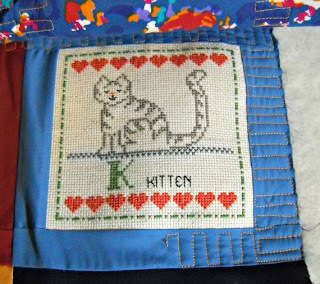 Well...I started cross stitching these blocks way back before I ever had children with the thought that someday...I may have a child...and this would be so cute hanging in his/her room. Well, now I have three children, 14, 8, and 3, and it's still not finished. 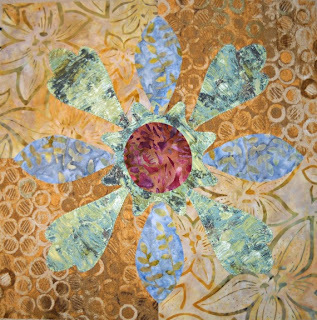 Someday...this may be hanging in one of my grand children's rooms...sigh! There's always hope, isn't there? Quilts from Quiltmaker's 100 Blocks, Spring 2013 issue should be on sale at your local newsstand today, March 5, 2013! Run out and get one right away! 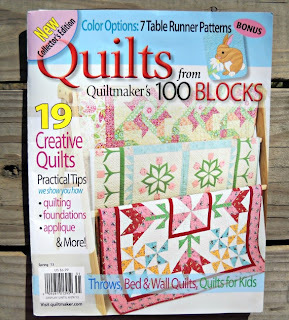 This is an amazing issue, packed full of great quilts, all made using blocks from Quiltmaker's popular 100 Blocks magazine series. One of my favorite things about this issue is they have directions to make a table runner for 7 of the patterns - think Christmas gifts. Oh yeah! 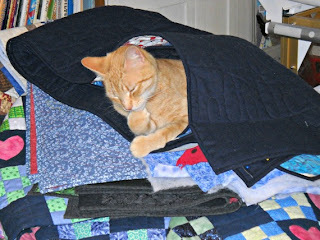 Instructions to sew my quilt, Fresh 'N Fancy begin on page 14. 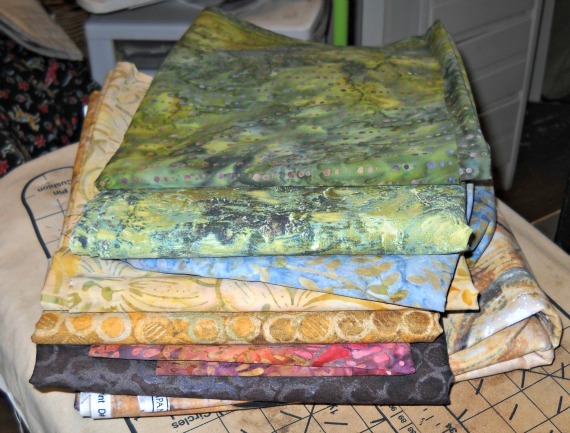 Here's the stack of fabrics I used to make my quilt. The fabric line is Continuum by Jennifer (Oh yeah!) Sampou, plus some batiks, from Robert Kaufman fabrics. A joy to work with. 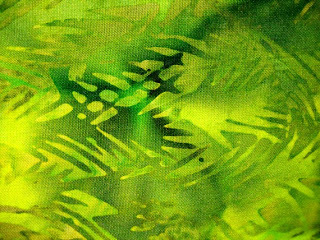 I love the way these fabrics glow. I designed this quilt using my block, Polka Party from Volume 5. It's block #429. I also used this block by Sara Tuttle Khammash. It's called Fresh Cut, out of Volume 4, block #343. I was pleased with the way these two blocks fit together. The pieced four patch background, and the circular motif on this block blend well with my Polka Party block. 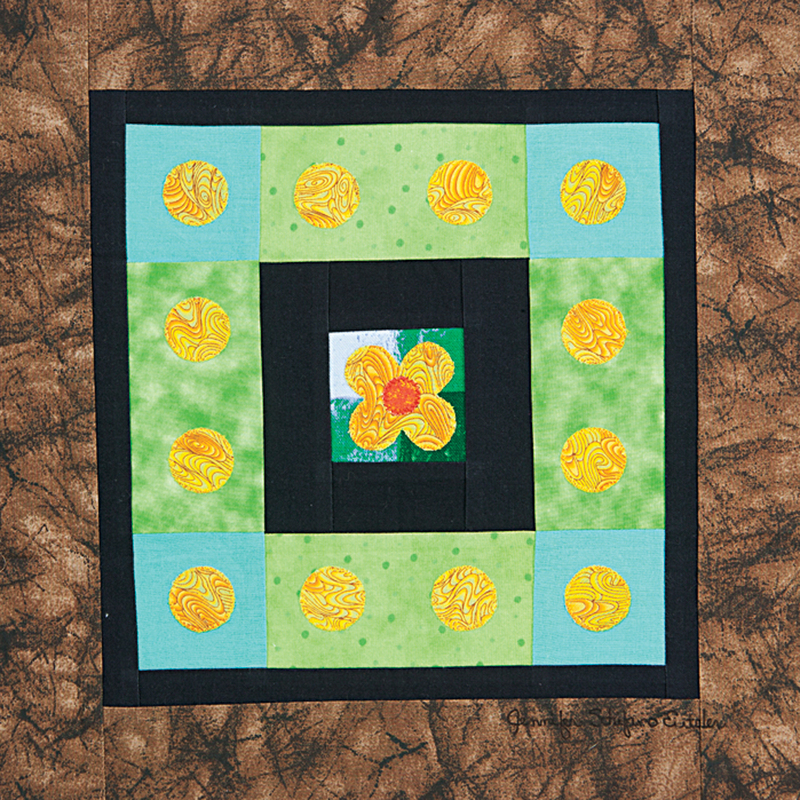 I added these simple half and quarter circle blocks, also on pieced "four patch" type backgrounds to round out the quilt design. Eeeek! 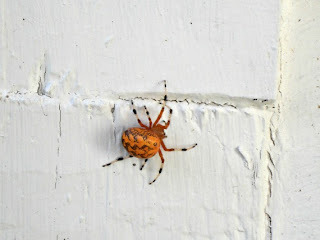 While I was stitching away, I found this super scary looking, but harmless spider right outside my studio door. Thankfully, it stayed outside. 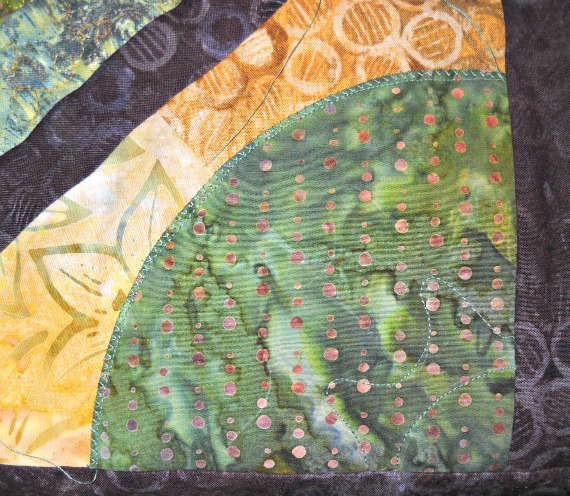 Here's one of my Polka Party blocks, before zig-zagging around the edges of the appliques. 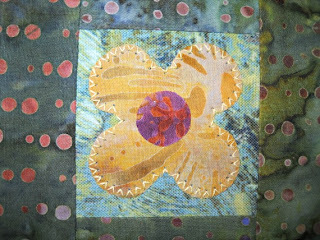 A close-up shot of one of the center flower motifs. My son, Gavin took this interesting shot of me sewing. What a great angle! 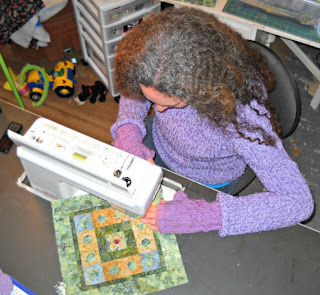 After sewing all the blocks it was time for a bathroom break. Whew! Here's a glowing clothesline pic of the top before adding borders. Love these fabrics! In this picture you can see the quilting in the corner. 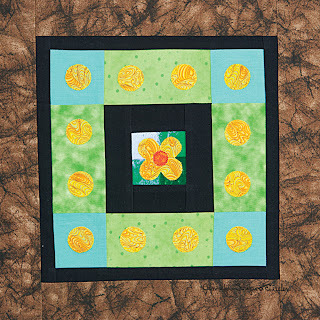 I used a motif from the Fresh Cut block for inspiration. 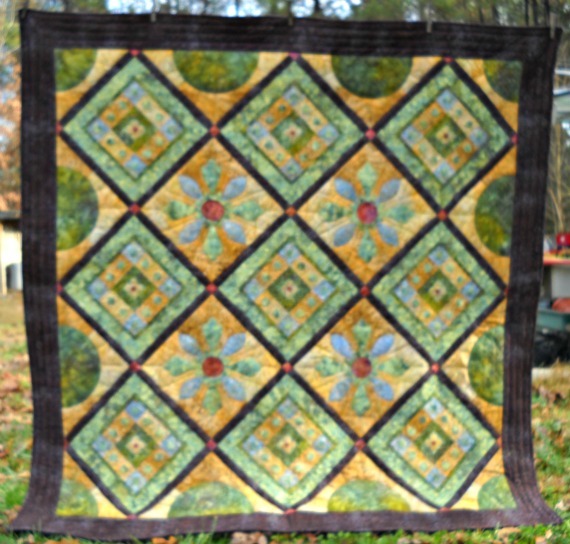 And finally, the quilt - all together - quilted, bound, and gorgeous! Thanks so much for reading my post today. 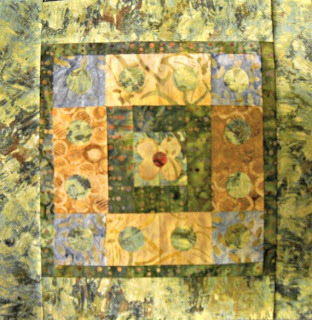 Now, go out and get a copy of Quilts from Quiltmaker's 100 Blocks, Spring 2013! Right now! Quick, before they're all gone.